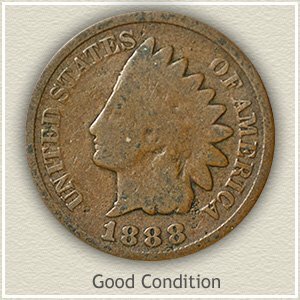 Commonly found heavily worn, if your coin is in better shape than average, 1894 Indian head penny value rises substantially. 1894 pennies are certainly special, not found as often as other dates in the 1890s, and in nice condition it is recognized by collectors as a scarce coin. It’s the amount of detail still visible that has not worn away that determines value. Examine the area behind her neck just below the ear, a clear separation of the ribbon and hair curls increases the value of your 1894 penny by $39 or more. Amazingly, a few of these old 1894 pennies avoided entering circulation, collectors and dealers at the time set some aside. Although rare, it’s because of their efforts in the past collectors today have high condition examples to enjoy. 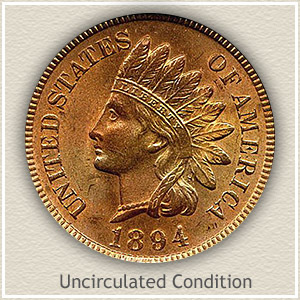 Pictured is one such penny, still bright with original mint luster this 1894 Indian head penny value rises above $80. The importance of condition is evident in the value chart. 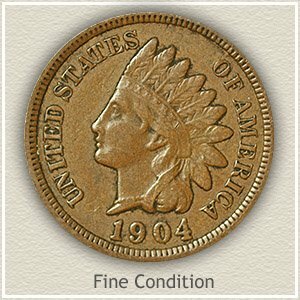 See the section on grading the condition of your old Indian pennies, it determines accurately how much they are worth. Valued in the hundreds and avidly sought by collectors the 1894 penny pictured is valuable because of its condition. Setting it apart is the coin's rarely seen originality. A remarkable feature is the deep golden and bronze toning, enhanced by original mint luster still glowing from beneath. It eye appeal certainly stands out above most others. Abrasions and nicks to the surface are so minor, few are visible under magnification. To survive without distracting contact marks is a rare occurrence. A limited number of 1894 Indian pennies can match this level of perfection. Proof of its desirability was apparent at a David Lawrence rare coin auction, bidders raised the value of an 1894 gem Indian penny to $207. Collecting these high quality old pennies is one of the popular areas of the hobby. An Indian penny might circulate for decades facing the many hazards of heavy use. The number of old pennies enduring scrapes, bending, dents and lots of wear is enormous. An 1894 Indian penny without these distractions is the exception and highly valued by today‘s collector. 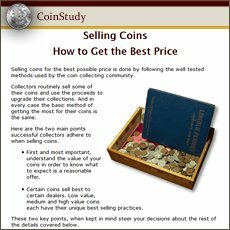 Compare the images and description to your coins. Extremely Fine: An 1894 Indian penny in "extremely fine" condition is well defined in all areas of the design. Boldly rounded and separated are the hair curls and headdress ribbon below her ear. The headband remains very detailed with every letter in "Liberty" complete and sharply defined. Overall a nice coin with some light wear that does not detract from its appearance. 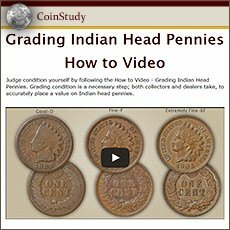 Fine: As a collectible coin, 1894 Indian head penny value is multiples a lesser grade example. Moderate with ample detail remaining is the appearance of a "fine" grade penny. Wear has reduced the highest details considerably but not to the point of merging one into the other. The ribbon behind her neck is still separated from the hair, although worn smooth as it crosses. Her forehead is fully detailed and apart from the headband. The headband despite obvious wear still portrays "Liberty." Good: If a coin’s surface has received extensive wear it is referred to as "good" condition. As your scan travels around the rim, it is important all lettering is visible. Although the portrait is very worn the bold design is clearly separate of the surface. Few details of the headdress remain, feathers are just an outline and the headband is obscured. Her facial features are very faint, the eye does have some depth and the cheek is faintly separated from her neck. If a small amount of roundness is visible to her face your 1894 Indian head penny value is slightly higher. A very popular coin, everyone understands and has heard of the value of an Indian Head penny. Common dates are now worth one dollar each. However today many collectors are building collections and putting a heavy demand on the rare dates and better condition coins. 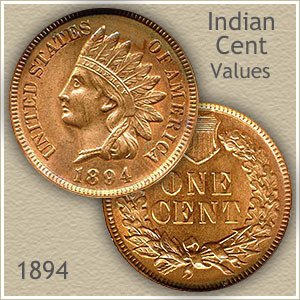 Find not only your 1894 Indian head penny value but all dates in the series are listed on the chart.